I was just looking through an Atlas of World History. It's so difficult to find certain topics. It's like they've been deliberately removed. Anyway, it seems Cro Magnon has it's centre in SW France. However, it shows CM sites from all over the world. The Clovis sites in America were CM. Also up in Alaska. In South America, Africa, Asian and Australia. I'm wondering if Kennewick man was CM? The re-creations I've seen would suggest that he was. Yes all the way from beach caves of Portugal till up upper North East Europe, But that's abit contradicting to the view that Cro-magnon comes from Siberia, I assume you talk Real Archaic Cro-magnon and not the modernised Cro-magnon or? CM from Siberia? Modern CM? Where did I say that? The basques are probably the decendants of the first white Cro Magnon man, skelettons found in the Basque land are identical to most modern living Basques, besides they have this RH negative blood group wich is not very common exept for Western Ireland and Wales and Galicia! I believe that 40% to 60% of the Basque Population is of the RH negative blood group. North American Indians have a more rugged CM look than South American Indians. Note the fine wavy hair too. Last edited by Mandible; Saturday, November 15th, 2003 at 08:21 PM. In what ways did Cro-Magnon differ from modern humans? I have heard that they were more robust and had a 4% larger brain. I have also heard that there were no differences. Also are Europeans the only ones decended from Cro-Magnon? If so were all other racial groups decended from Homo-Erectus? Wita sceal geþyldig, ne sceal no to hatheort ne to hrædwyrde, ne to wac wiga ne to wanhydig, ne to forht ne to fægen, ne to feohgifre ne næfre gielpes to georn, ær he geare cunne. Beorn sceal gebidan, þonne he beot spriceð, oþþæt collenferð cunne gearwe hwider hreþra gehygd hweorfan wille. The Cro-Magnons form the earliest known European examples of Homo sapiens, the species to which modern humans belong. The term falls outside the usual naming conventions for early man and is used in a general sense to describe the oldest modern people in Europe. The oldest H. sapiens (i.e. anatomically modern humans) first emerged around 100,000 years ago. Cro-Magnons lived from about 35,000 to 10,000 years ago in the Upper Paleolithic period of the Pleistocene epoch. For all intents and purposes these people were anatomically modern, only differing from their modern day descendants in Europe by their slightly more robust physiology and brains which were about 4 percent larger than that of modern man. The Cro-Magnons could be descended from any number of subspecies of Homo sapiens that emerged from Africa approximately 100,000 years ago, such as Homo sapiens idaltu. The geologist Louis Lartet discovered the first five skeletons in March 1868 in the Cro-Magnon rock shelter at Les Eyzies, Dordogne, France. The definitive specimen from this find bears the name 'Cro Magnon I'. The skeletons showed the same high forehead, upright posture and slender (gracile) skeleton as modern humans. Other specimens have since come to light in other parts of Europe and in the Middle East. The European individuals probably arrived from a North African origin via South Asia, Central Asia and the Middle East. However, this is highly speculative since no Cro-Magnon remains have been found in Africa (though the North African ancestors of Cro-Magnon man would have been pre- Cro-Magnon). The condition and placement of the remains along with pieces of shell and animal tooth in what appears to have been pendants or necklaces raises the question whether or not they were buried intentionally. If Cro-Magnons buried their dead intentionally it shows us they had a knowledge of ritual, by burying their dead with necklaces and tools, or an idea of disease and that the bodies needed to be contained. Analysis of the pathology of the skeletons shows that the humans of this time period led a physically tough life. In addition to the infection, several of the individuals found at the shelter had fused vertebrae in their necks indicating traumatic injury, and the adult female found at the shelter had survived for some time with a skull fracture. As these injuries would be life threatening even today, this shows that Cro-Magnons believed in community support and took care of each others' injuries. Surviving Cro-Magnon artifacts include huts, cave paintings, carvings and antler-tipped spears. The remains of tools suggest that they knew how to make woven clothing. They had huts, constructed of rocks, clay, bones, branches, and animal hide/fur. These early humans used manganese and iron oxides to paint pictures and it is believed that they created the first calendar around 32,000 B.C. I read that modern UP types are related to the ancient cro-magnon man. I think cromagnon examples are rather good looking, and am glad to descend from them! 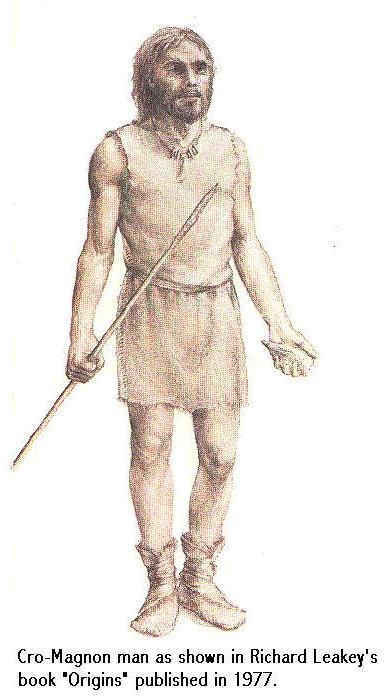 An anthropological fact usually ignored in popular TV shows and documentaries is that there are notable differences in types of paleolithic man. In such shows the terms Cro-Magnon and Modern Man are used as if they were synonymous, whereas strictly speaking they are not. All Cro-Magnons are Modern, but all Moderns are not Cro-Magnon. Eastern European types are different both physically and intellectually. Cro-Magnon's distribution is limited to western portions of Europe and North Africa, as well as a number of Atlantic islands. Even some limited portions of South America have a type called Cro-Magnoid (meaning possessing some Cro-Magnon characteristics). These distinctions assume greater importance when Atlantis is viewed as the possible source of the type known as Cro-Magnon. Last edited by GreenHeart; Sunday, October 23rd, 2005 at 12:38 PM. I had heard that it is mainly Northern Europeans that are descended from Cro-Magnon hence the Borreby and Brunn types.